After much procrastination I finally got around to installing a new vanity top in my 1953 bathroom. While pulling out the old top the worst happened: I broke a sea foam tile. I assumed I would be able to replace the tile fairly easily since sea foam was a common color from that era. In fact, it was not simple. I found tiles online, but in larger lots and I only needed one. Before I could proceed I very carefully cut around the old grout with a grout rake and pried out what was left of the remaining tile. I called a local store that specializes in decorative tile hoping they might have that color in stock. The man I talked to told me there was no money in mid century tiles and he didn’t have any. He must have sensed by desperation as I described my jagged mess of a tile right next to my shiny new vanity top. The man thought for a minute, as if considering the wisdom of letting a stranger in on a trade secret before finally spilling the beans in a conspiratorial tone. He told me to take a chip from the broken tile to Lowe’s paint department and have them scan it to match the color. I did that and asked for a small sample container of paint, which cost around $3.00. (Note: the samples only come in satin finish and the tiles are glossy.) 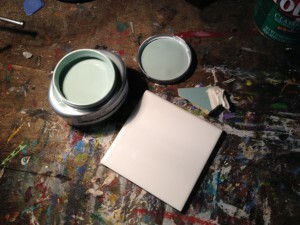 After procuring the paint I found a white 4.25 inch tile for under a buck in the tile department. Happily, the size was, and still is, standard for square bathroom tiles. 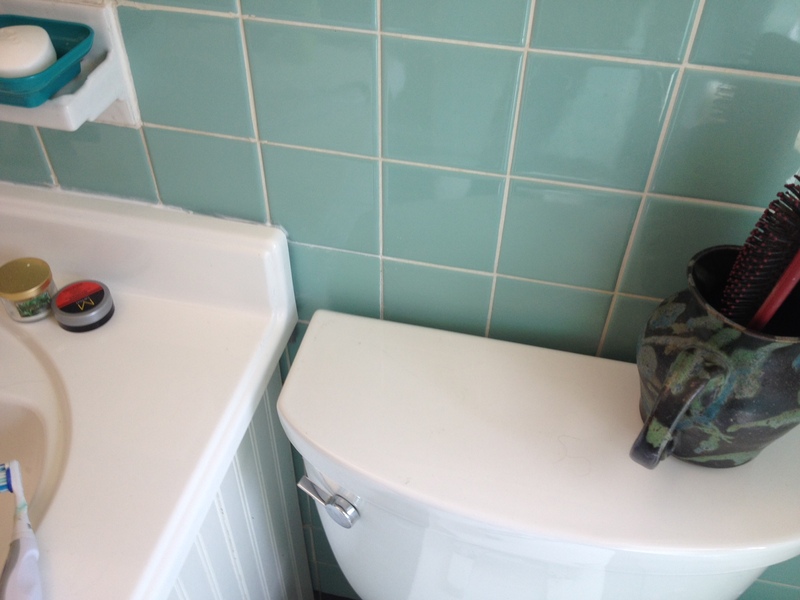 I also picked up a small tub of a grout and mastic combo for sticking the new tile to the wall and grouting it in. When I got home I painted the tile with an all purpose primer. This step is important because the paint won’t stick to the tile otherwise. After the primer dried I sanded it lightly to try and get it as smooth as possible. 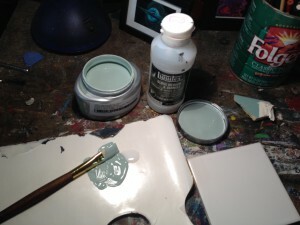 I then painted the tile with several coats of my sample color. I had some some acrylic gloss medium on hand and I added some to the paint to enhance its sheen. The gloss medium might not be absolutely necessary but I recommend it. Also, I used a brush but in hindsight a foam applicator would have been better. I back buttered my replacement tile and eyeballed the eighth inch gap for the grout. When it was dry I used a sponge to grout in the new tile, being careful not to leave any grout on the tile. The next day I cleaned it off with a damp sponge. Though not a perfect match I think it looks pretty darn good. My friend at the tile shop told me to put a coat of car wax on it, let it dry and then buff it out as a final step. I haven’t done that yet and I’m not sure if I need to! If you can’t tell, the new tile is the one directly to the right of the vanity top.